So the celebration continued as our school organized a Raya Open House/ Canteen today! 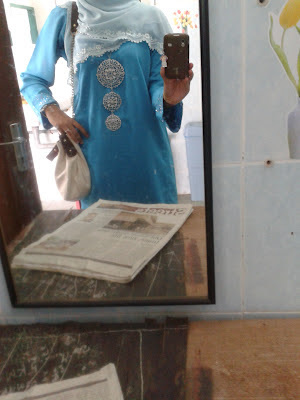 I got up, full of spirit to don in raya kurung. completed with accessories hoccay! And FYI, I am the type who do not bother about accessorizing but today I put extra effort for the appearance and glad I did. Anyhoo, the reason I dont accessorize is because my forever-expensive skin is not tolerant to materials other than pure gold or silver. B, I wish you're here..